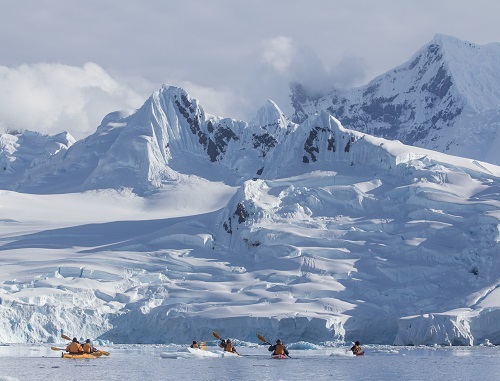 For most people, the thought of kayaking the waterways of the Antarctic Ocean is fairly daunting. But for Ewan Blyth and Sophie Ballagh, it’s something they undertake every day – with 25 tourists in tow. We spoke to adventure kayak guides Ewan and Sophie to hear more about their story “Navigating the White Continent” and to understand what it takes to be a tour guide in one of the most hostile environments on the planet. How does one get into tour guiding in the Antarctic, you might ask. 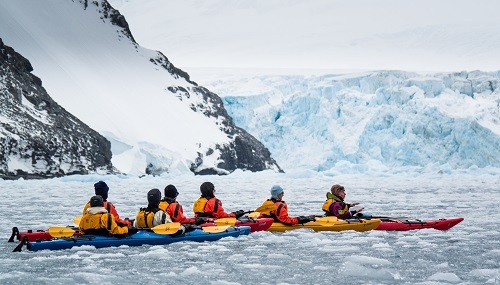 For both myself and my partner, Sophie, adventure guiding has always been our passion and after kayaking in Antarctica, we fell in love with it. We were both drawn into kayaking by passionate, devoted outdoor education teachers during our schooling years. Very similar men in many ways, just in different schools, in different countries providing opportunities to similar students. Sophie’s direction in life pointed towards guiding from the moment a school careers advisor identified it as a potential career path. I on the other hand, started a little differently. After a professional career in a totally non-related industry (a desk-job! ), I fell into outdoor guiding rather unexpectedly and without meaning to! We have both guided in many parts of the world but keep being drawn to the Antarctic because it is so special and so unique. Being out on the water every day, in such a special place as the Antarctic is incredible. It means we have perhaps the best office in the world. Although it does sometimes feel like there are some problems with the air-conditioning! Guiding in Antarctica means we get to give people the gift of experiencing a place otherwise mostly off-limits. The outdoors is our temple, it’s our place of belonging and exploration of the outdoors satisfies our curious minds. As the world gets more technological, we feel that people are being more and more disconnected from the natural world. We are beings of the natural world. That is where we came from, it is what we are. We have much to learn from the natural world and thus connecting with it brings great joy to one’s life. Also, we rely on the natural world for our survival. If we do not connect with it, we will not protect it and it needs protection from the actions of human beings. And that’s what we aim to instil in people during our expeditions. 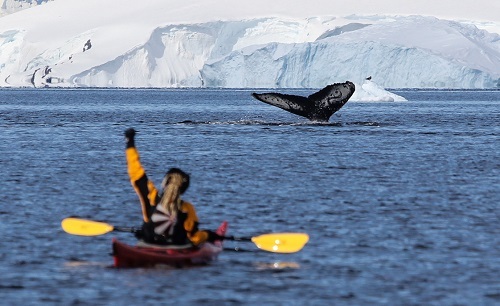 Don’t get me wrong though, kayaking in the Antarctic doesn’t come without its risks. The greatest hazard as we see it – both in terms of likelihood and consequence (the two key factors of risk) – is ice. This can be in the form of icebergs or glaciers. Both can be incredibly beautiful but incredibly dangerous if humans behave inappropriately around them and don’t both respect them and understand the risks. Trying to communicate this to clients can sometimes be very difficult as it can be challenging trying to understand the risks of something you have never seen before. Particularly when you’re having a once in a lifetime experience as well. But, the times when things go wrong are very slim. The majority of the time on our expeditions, we are able to bring such joy to our clients through our services and skills, able to encourage them to have a take a part of Antarctica away with them in their hearts as well. And that, at the end of the day is the most fulfilling thing about our job. By leading these clients through the incredible landscape of the Antarctic, we hope to inspire them to make an effort to change and to help the fight against climate change. Our hopes are that this wilderness will continue to be preserved for peace and science as the original Antarctic Treaty advocated. We hope that this will extend not only to the land as per the Treaty but also to all the waters that surround it. And we hope that tourism is responsibly managed moving forward. Not an easy task in any part of the world but as important in Antarctica, as anywhere. To read more about Ewan and Sophie’s story guiding in the Antarctic, click here. This entry was posted in Travel, Water Sports, Winter Sports and tagged Antarctica, Kayaking. Bookmark the permalink.